To Sum It Up: Meghan Chase's life has never been exactly normal. On her sixth birthday, her father vanished without a trace. Ten years later and now living in a remote area in the Louisiana bayou, Meghan is about to experience an unforgettable sixteenth birthday. Her brother Ethan is kidnapped and replaced with a faery changeling, and her best friend Robbie Goodfell reveals himself to be none other than the legendary trickster, Puck. Together they set off for the faery world of the Nevernever in search of Ethan. Meghan soon finds herself face-to-face with the faery king, Oberon, who she is stunned to learn is her real father. When the fey courts edge closer to war, Meghan becomes caught in the middle, all while still trying to rescue her brother from an evil force that threatens the Nevernever itself. 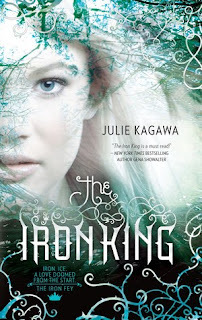 Review: I loved the world of The Iron King. It seamlessly blended fairytale with reality. This is my favorite kind of fantasy book, in which the fantasy elements are written so vividly as to appear perfectly plausible. Why can't a talking cat with a wicked sense of humor and the ability to disappear at will exist? The Iron King boasts a great cast of characters. Despite all of the trials that Meghan faces during her journey, she maintains her focus on saving Ethan and doesn't spiral into self-pity. Going into this book, I wasn't sure if I would need to reread Shakespeare's A Midsummer Night's Dream, which famously features Oberon, Titania, and Puck. I think that their depictions in The Iron King stand on their own and don't require the reader to have already been familiar with them. (Actually, most of what I know about those characters comes from their appearances on the 90's cartoon Gargoyles. That was a great show!) Julie Kagawa's Puck is especially interesting. He's as cunning as ever, but he also shows off some serious fighting skills. Most importantly, he genuinely cares about Meghan. Puck's rival in the sarcasm department is the sly cat, Grimalkin. Grim pulls double duty as comic relief and keen observer. I hope that Grim and Puck share many more scenes together in the rest of the series. Of course, this review wouldn't be complete without mentioning the Winter prince, Ash. Now, I have a HUGE weakness for ridiculously handsome, brooding, male characters whose stony exteriors can only be cracked by the love of a good female protagonist, preferably after much squabbling. Does Ash meet those criteria? Absolutely. My only quibble is his shift from personifying “Winter prince” (resisting the urge to make a comparison with thawing ice here) to lowering his emotional defenses. At first the change was gradual, but then suddenly it seemed like it had skipped a few stages. As I said, though, this is a nitpick. Finally, I thought that the story of how the Iron fey came into existence was very original. It added a creative, modern twist to faery lore that also makes the reader consider the potential consequences of our ever increasing reliance on technology. All in All: I borrowed this from the library but definitely need to buy a copy of my own, along with the rest of the books in the series!